You’re probably used to seeing handicapped parking spaces in front of stores and restaurants, or perhaps even familiar with the growing number of automatic doors into public buildings that are handicapped-accessible. And to someone who’s never had the experience of being disabled, these small conveniences might seem almost like a luxury. Did you know, however, that nearly one in five Americans has a disability – and that more than half of them identify it as severe? For people who live with a disability, simple things like parking spaces and door buttons are not a convenience, but a necessity. Many disabled people struggle to do things like housework or even fixing meals. They often have difficulty lifting items like grocery bags or grasping a glass of water. But aside from overcoming physical challenges of daily life, many people with disabilities also suffer from discrimination. The term ableism refers to the “practices and dominant attitudes in society that devalue and limit the potential of persons with disabilities.” When we talk about ableism, we’re talking about not treating those with disabilities as whole people. Ableism assumes that able-bodied people are superior to anyone living with a disability. If you’ve never heard this word before, you’re not alone. Unlike racism or sexism, which are two types of prejudices that are widely referenced and discussed, ableism is not as mainstream. Does this mean that ableist beliefs are not as harmful or negative? Absolutely not. Discrimination towards people with disabilities is just as damaging. And because ableism is not talked about as commonly as other inequalities, it may actually be harder to know when you are contributing towards ableist tendencies. What Can You Do to Stop Ableism? Watch what you say. It’s easy to brush off using certain words as “no big deal,” but to people living with a disability, these terms can be both disrespectful and hurtful. And maybe it’s a no-brainer that a word like retarded is not okay to use, but things like crazy or spaz or psycho also have harmful effects. 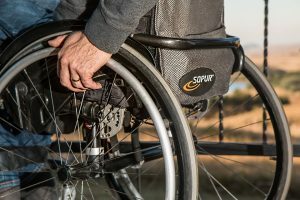 Be sure to refrain from using any sort of language that targets someone with a disability (and for a helpful, more detailed guide – click here). Be considerate. As an able-bodied person, you might forget that you have access to just about everywhere – and that someone with a disability might not. Places like handicapped bathroom stalls and the front seats of public transportation were put there for a reason. Though you might not be intentionally discriminating against people with disabilities, you are inadvertently doing just that by utilizing the resources there for them. So instead of taking the elevator and crowding it for someone who needs it, take the stairs or the escalator. Always ask before assisting. One of the worst assumptions that an able-bodied person can make is that everyone with a disability is incapable of helping themselves. People living with disabilities know how to ask for help, and will when they need it. However, if you see someone who seems to be struggling, be sure to ask permission beforehand. Even if they decline, they will likely appreciate the gesture. In addition to these simple ways to do your part to fight ableism, take the time to learn more about people who live with disabilities. Participate in the Dignity & Respect Campaign’s Building Cultural Awareness Initiative and download our discussion guide and reading list for this month. Ask yourself questions about living with a disability, such as how you talk about disabilities or who should be responsible for supporting disabled persons. Remember: differences are only barriers if we allow them to be. Do your part and learn how you can help to make this world a better place – for ALL to live.